As the 80’s turned into the 90’s, the “Hair Metal” era had finally run it course. The advent of Grunge Rock had turned the music industry on it’s head, changing the landscape from a fun loving, Rock n’ Roll party crowd into an angst inspired movement that seemed obsessed with introspective solidarity. As bleak as it may have seemed, there were a few bands that defied logic and continued to sell massive amounts of records early in the 90’s. After their self-titled debut album (1990) reached platinum status, STEELHEART, one of the most talented bands to every grace the Hard Rock genre, was a band with an iconic sound that gave hard rock fans a thread of hope to challenge the “changing of the guard”, if you will. And they were doing it… But on Halloween night in 1992, while touring on their sophomore album, "Tangled In Reins", an onstage freak accident seriously injured lead singer, Miljenko Matijevic, leaving him facing months upon months of physical trauma and years of mental anguish and soul searching. The band went on hiatus for a while and eventually “threw in the towel”, leaving the future of this critically acclaimed super-group on hold. There were really good releases in 1996 and 2008, but now, with the release of the masterpiece, “Through Worlds of Stardust” (via Frontiers Music) 27 years after their debut dropped, Matijevic has the band back to where it was heading almost three decades ago. From the first second of the first track, Matijevic emphatically puts to rest any questions about whether Father Time has robbed him of any power in his voice. Belting out one of his iconic high pitch screams from the onset of “Stream Line Savings”, he displays the kind of effortless range that has set him apart from his peers over the years, and couldn’t have started this hard rocking release off any better. The song is edgy and commanding, loaded with powerful riffs and grooves, with the vocals being “the icing on the cake”. Songs like “Come Inside”, “My Word”, and “My Dirty Girl”, are equally as imposing, offering a blueprint on how to play real Hard Rock to new, up-and-coming bands. 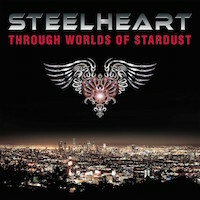 Although STEELHEART churned out some of their heaviest tracks to date on “Through Worlds of Stardust”, down-tempo songs like “My Freedom”, “You Got Me Twisted”, “With Love We Live Again, and the instant classic, “Lips Of Rain”, is where they create magic. And with the highs and lows Matijevic has endured since STEELHEART achieved platinum status in the early 90’s, the ballads are where an openhearted unmasking of emotions that have been, no doubt, dwelling inside this extremely talented superstar, take center stage. This is as passionate a Hard Rock album as I’ve heard in years. On “Through Worlds of Stardust”, STEELHEART’s return is not as a ceremonial “comeback”, or as a glorified reunion group, but as an elite, relevant Rock n’ Roll band that warrants a place in the current mainstream rotation. This album doesn’t feel like a seasoned band making a return, but a continuation of an evolution that began almost 30 years ago. For me, STEELHEART is a musical paradigm of the void that has advanced the decay of the Hard Rock genre. Long story short; without the talent and authenticity of bands like this at the forefront of the Hard Rock genre, the party is over.